Welcome to Autopartz Prestashop 1.7 Theme! We would like to thank you for purchasing Autopartz Prestashop 1.7 Theme! We are very pleased you have chosen Autopartz Prestashop 1.7 Theme for your website, you will be never disappointed! Before you get started, please be sure to always check out this documentation. Autopartz is a responsive, clean and modern Prestashop 1.7 theme which will be a perfect match for your online store. Autopartz is a Responsive Prestashop 1.7 theme with extremely customizable admin settings. Great as a starting point(Kick) for your online Business. It can be suitable for any kind of eCommerce shops, including Digital, Mobile, Fashion, Bags, Shoes, Accessories, etc. This Prestashop 1.7 theme has advanced features which will make your website becomes more professional with clean and classy layouts. It is fully responsive and looks stunning on all types of screens and devices. Unleash your creativity and build something amazing with Autopartz Prestashop 1.7 Theme! We recommend you to duplicate your live store on a development store and try installation on it in advance. Backup Prestashop 1.7 files and the store database. Disable all cache related section that you have in your Prestashop 1.7. If you need help for installing Prestashop, follow the instructions in Prestashop Doc Guide.. Note: We recommend to use this theme on a new, clean installation or existing shops without custom core modifications. Note: If you don't know how to check these requirements, ask your hosting provider. 1. Download theme package of your purchased theme and extract it. 2. Now Go to theme-files folder where you will find the zip (ps_autopartz_vX.X.X.zip) file. 4. Now click on Add new theme button at top right corner. Once you select theme, click on Save button. In this option, here you have to enter the URL where the ZIP file is available. Now click on Save button. In this option, You have to upload Theme File Package named ps_autopartz_vX.X.X.zip to your themes/ directory of your prestashop setup. Now select the ZIP file which you have uploaded at themes/ directory. 6. Now click on Use this theme button for activate new theme. 7. Your theme is now installed and ready for work. 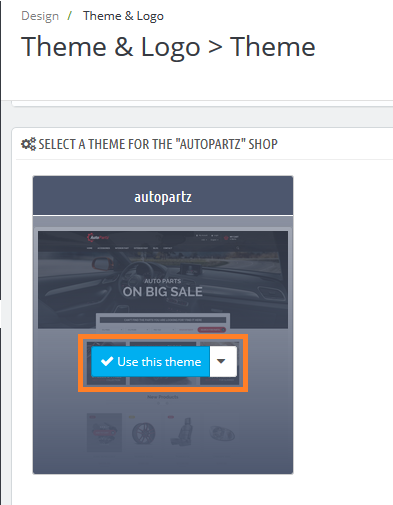 Note: Once you installed Autopartz theme, all the static blocks and pages shown in live demo will be installed automatically to your Prestashop 1.7 setup. In order to add the demo images used inside the theme, upload all static images (theme-images > img > cms) on your server in /[your prestashop root directory]/img/cms/ directory using FTP or Cpanel. 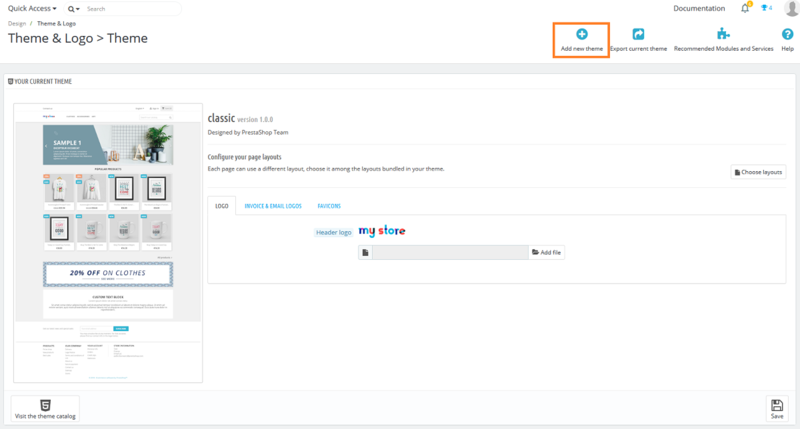 Login to your Prestashop backend panel and navigate to Design > Theme & Logo. Inside Prestashop backend panel navigate to Design > Image Settings. At Design > Image Settings this location, Set image quality as per your requirement. In order to see the changes after you update the image sizes, image quality. You must have to re-generate the images is using in your site. Inside Prestashop backend panel navigate to Design > Positions. Check below image to see the example position of modules. Now the general options for Autopartz are configured. In this section, you will learn how to configure theme module easily. Inside Prestashop backend panel navigate to Modules > Modules and Services and than select Installed modules. Search Hiddentechies, here you will see Hiddentechies Static Blocks module. Click on Configure. Now you can see the demo blocks installed by theme to specific hook. Here, you can manage add/edit/delete of the static blocks. This is how you can manage the static blocks using this module. Search Hiddentechies, here you will see Hiddentechies Brand Image Slider module. This is how you can configure the brand image slider using this module. Search Hiddentechies, here you will see Hiddentechies Theme Pre Loader module. This is how you can configure the theme pre loader using this module. Search Hiddentechies, here you will see Hiddentechies Sticky Header module. This is how you can configure the sticky header using this module. Search Hiddentechies, here you will see Hiddentechies Promotion Bar module. This is how you can configure the promotion bar using this module. Search Hiddentechies, here you will see Hiddentechies Newsletter Popup module. This is how you can configure the newsletter popup using this module. Search Hiddentechies, here you will see Hiddentechies Scroll To Top module. This is how you can configure the scroll to top using this module. Search Hiddentechies, here you will see Hiddentechies AddThis Social Buttons module. This is how you can configure the addThis social buttons using this module. First You have to Upload Xpert Prestashop Blog Module zip file.. This is how you can configure the xpert prestashop blog using this module. Please, if you have any questions, run into any issues or just need some help, do not hesitate to contact us via our Support Center. We believe in providing the best support possible, and we monitor our Support center just about 24/7. Your feedback is absolutely welcome!